1866WeJunkit.com, a large dumpster rental and junk removal firm located in the New York metropolitan area, has launched a best- in-class, responsive website designed by Trighton Interactive. We want clients to be able to find us and get a hold of us when they need our services. That's why we had Trighton Interactive develop a responsive website. 1866WeJunkit.com, a large junk removal firm located in the New York metropolitan area, has launched a best- in-class, responsive website designed by Trighton Interactive. 1866WeJunkit.com provides professional junk removal, demolition, dumpster rental and clean-out services to individuals and companies in Nassau and Suffolk counties, the Bronx, Brooklyn, Queens, and Manhattan. Prompt, professional service is important to Ralph Giglio, President of 1866WeJunkit.com "We answer our phones personally, 24/7, and we provide same-day service," says Giglio. "We want clients to be able to find us and get a hold of us when they need our services. That's why we had Trighton develop a responsive website." Jody Resnick, CEO of Trighton Interactive, explains that the analytics on 1866WeJunkit.com showed that most of their customers are in the field on construction job sites. 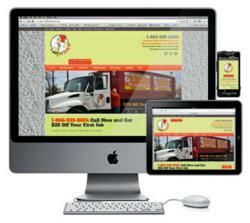 "A responsive web site is the perfect solution," says Resnick. "A traditional website would not display well on prospective and current client's smartphones or tablets, and a mobile site would not include all of the content about the company's services that's available and on the traditional website. The responsive site Trighton developed provides an optimized experience for contractors on job sites - or anyone anywhere - with click-to-call functionality, pricing on all services offered, request a quote functionality. Trighton Interactive, located in Orlando, Florida, is a leader in responsive web design that displays optimally on all devices. For more information on responsive web design or integrated online marketing strategies that will make your business boom, visit http://www.trighton.com. To admire the leading responsive website in the dumpster rentals and junk removal industry, please view http://www.1866wejunkit.com.